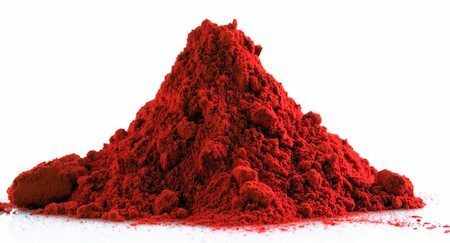 Astaxanthin is a red pigment found in nature (mainly fish and other sea creatures) and belongs to the carotenoid family. Carotenoids are mainly produced by micro-organisms like algae, but animals are unable to make them, meaning all natural carotenoids are first produced by a plant species. When a carotenoid plant is consumed by an animal, the pigment (and its other vital nutrients) are transferred to the animal. Why Are Carotenoids Important to Our Health? Remember when you were a child and your mother told you, ‘eat up all your carrots, and you'll be able to see in the dark', well this is not too far away from the truth! It has long been known that carotenoids are linked to improving eyesight, including dry eye syndrome, age related macular degeneration and diabetic retinopathy, even glaucoma. Carotenoids have also been proven to help protect against heart disease, in particular high blood pressure, and some cancers can be ‘slowed' down by their introduction to the body. Zeaxanthin, a close cousin of astaxanthin, is the synthesized carotenoid found in red and orange fruits and vegetables, such as red peppers, carrots, pumpkin and tomatoes. The function of carotenoid is an antioxidant, which become soluble in the body, protecting from free radicals – the ‘nasties' which surround us in the air and atmosphere. Some green leafed vegetables also contain carotenoids, but their chlorophyll content is powerful enough to shadow the usual pigment. Astaxanthin is thought to be the most potent carotenoid that nature provides, and is frequently referred to as ‘the king of the carotenoids'. It has been shown to be 500 times stronger than Vitamin E and ten times as powerful as beta-carotene. What Can Astaxanthin Do For You? Have you ever noticed, on a television wildlife program, the bright red color of salmon roe (mass of eggs)? This is because of astaxanthin. Without high amounts of it in the egg mass, the baby salmon would almost certainly fry, or just go bad in bright sunlight. This is the first powerful health benefit of astaxanthin – a UV (sun) light blocker, which offers the same benefits to humans. UV radiation, a ‘free, or oxygen radical', is the cause of one of modern times menacing diseases -skin cancer. UVA light from the sun causes oxidative stress in skin tissue, that can be blocked to a degree, by the presence of this natural antioxidant. By the way, this carotenoid offers up to 200 times more protection than other types, like beta-carotene and lutein (when referring to melanoma). Additionally, this naturally found nutrient has been shown to minimize wrinkles and enhance skin moisture levels. Sockeye salmon has the greatest amounts of astaxanthin found in an animal, in its purest form. It is credited with giving salmon the energy and strength they need to make their annual upstream journey to spawning sites. It can supply humans with the same elevated strength in addition to providing faster recovery after exercise, which is great news for people who are involved in any type of resistance training, like bodybuilders and weight lifters. Additional health benefits of astaxanthin include support for the immune system, improved heart health, brain health support, and protection of cells and nervous system from oxidative damage, just like we discussed with skin. When combined with the superior omega-3 fatty acids found in krill oil, it can also relieve joint pain, even reduce the symptoms of arthritis. There are several natural sources of astaxanthin. Dissimilar to chlorophyll or beta-carotene which are found in land plants, astaxanthin is mainly found in aquatic life. A type of micro-algae, it is eaten by many different types of aquatic animals and its bright red pigmentation gives these animals their red or pink flesh or outer shell. Red-colored birds get their color by eating fish and plants with elevated levels of astaxanthin. Haematococcus pluvialis is the truest form of the micro algae with highest concentrations of astaxanthin, and it is what fish feed on. Other sources include crab, lobster, red trout, crawfish, crab, and krill. It is of interest to note that commercial fisheries often supplement fish feed with synthetically manufactured astaxanthin to give fish an appearance similar to the fish caught in the wild. The synthetic version is made from petrochemicals. This type of astaxanthin is very different form the natural product and is up to 50 times weaker than the natural product! Natural production of astaxanthin is not limited to aquatic plants and animals, mind you. A yeast species known as Xanthophyllomycesdendrorhous (Phaffia) also has fairly high levels. Just like the pigment found in micro-algae, Phaffia does not absorb the astaxanthin from other sources, but actually manufactures it. The aquatic carotenoid that is safest for human use is the one produced by micro-algae. This is backed by numerous medical studies, which prove it is safe for human consumption. The astaxanthin produced from the yeast Phaffia, however, does not have sufficient safety backing and thus is not approved for consumption of more than 2 milligrams a day by the FDA, nor is it approved for long term use in children. Why Take Astaxanthin in Supplement Form? You simply could not get all the astaxanthin your body may need (unless you were eating red salmon or lobster every day), so getting a natural form of it in supplement form is highly recommended. It is generally used as an antioxidant and it helps with some chronic illnesses – reducing the symptoms of cardiovascular disease and high blood pressure, fighting cholesterol and improving brain health. 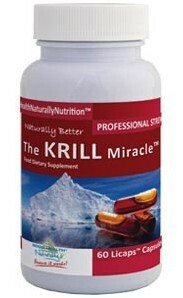 Additionally krill oil is also effective at improving eye health, and can also increase male and female fertility. Taken as a supplement it can enhance muscle strength and endurance. Astaxanthin is a very strong anti-inflammatory and a pain reliever. It has the ability to block various chemicals in the body that cause pain. While completely natural, it works like some prescription analgesics without the risk of addiction. Even though astaxanthin is an anti-oxidant and a carotenoid like beta-caretene, lutein and canthaxanthin, it possesses a unique structure and works in specific ways. Where most other antioxidants get used up after having eradicated free radicals and other toxins, this aquatic micro-nutrient has an abundant stock keeping it active for much longer. Most other antioxidants are broken down by chemical reactions. Not so, with recommended dosages of astaxanthin – it stays intact. Also other antioxidants like vitamin C, E and others typically deal with free radicals one at a time, this wonderful carotenoid can neutralize multiple free radicals at the same time-in, certain situations up to 19 in one go. 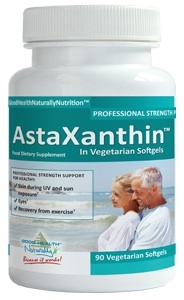 Where Can You Get Astaxanthin? The source we use and recommended source is Good Health USA. They guarantee natural, quality products, that are available for worldwide shipping. They have one specific product, plus two others – krill oil and fertility packs, to help women conceive for a baby.